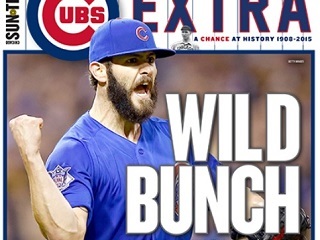 The front-page word of the day in Chicago: "Wild." The Cubs’ 4-0 victory over the Pittsburgh Pirates in the National League wild card game is obviously major front-page news today in Chicago. Starting with the Sun-Times, which went with a special eight-page Cubs Extra wrap. Also getting in on the “Wild” lead headline fun today: the Lake County News-Sun (Waukegan), CBS.com Chicago and the Daily Southtown (Tinley), pictured respectively below. P.S. In case you’re wondering, Chicago’s other major daily, The Tribune, went with “Lift-Off” for their Cubs front-page hed.